This recipe was originally written for Town & Country. I love the flavours of Thai seasoning; fragrant, light and just the right amount of zing. This is a one tray Thai inspired version of baked gratin with veg and fish on the side. I slice the sweet potatoes very thin and bake them in a flavourful zingy dressing before tossing in the broccoli and cooking the fish skin side up making sure its skin is nice and crispy. I’d ask your fishmonger how long to cook your fillets for in a hot oven as the sizes you purchase may vary. 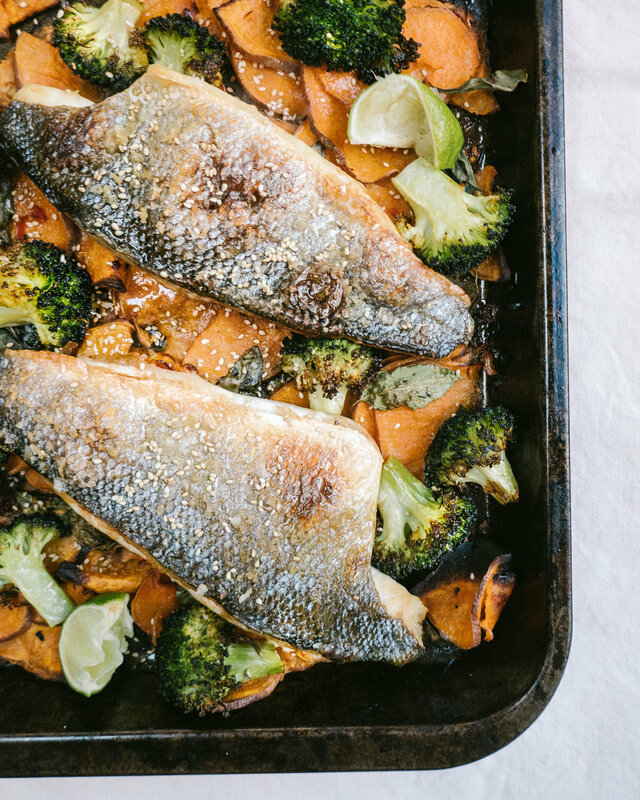 This recipe calls for two generous sized fillets of sea bass but if yours are smaller you may find they need less cooking. Preheat your oven to 200 degrees/fan setting. Slice your sweet potatoes very finely either using a sharp knife or mandolin. Take care whilst doing so. Transfer onto a roasting tray. In a small bowl combine your dressing ingredients. Pour over the sweet potatoes and toss through with your hands making sure they are well coated. Bake for 15 minutes. After 15 minutes remove the tray from the oven. Toss through your Thai basil leaves with a spatula. 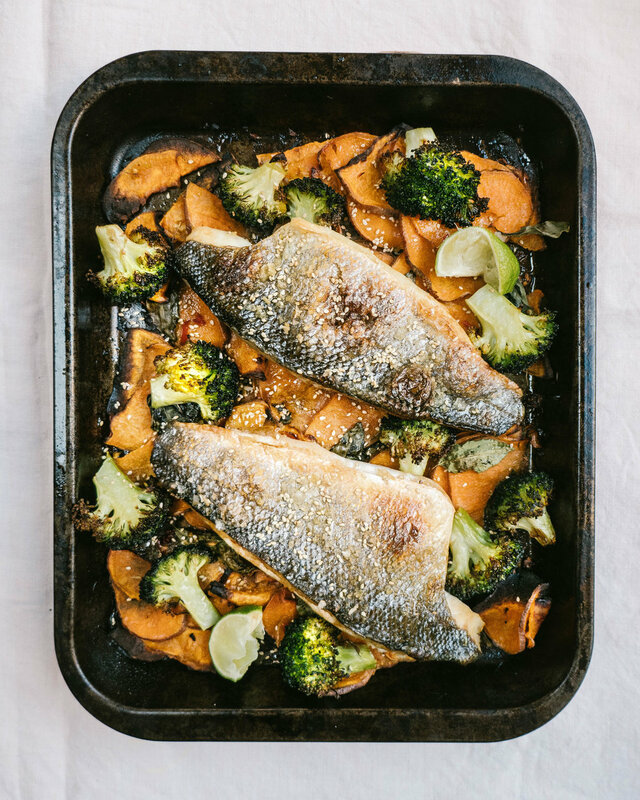 In a small bowl toss your chopped broccoli in about 2tbsp olive oil and scatter evenly over the potatoes leaving space for the sea bass fillets. In the same bowl add a further 2tbsp of olive oil. Add your sea bass fillets and use your hands to rub them in oil. Place them on the tray with the sweet potatoes and broccoli. Sprinkle generously with sea salt and return to the oven for 15 minutes. I like to switch my oven to a grill setting and ramp up the temperature for the last five minutes to get a really crispy skin. When your fish has cooked through remove the tray from the oven. (A good test that avoids ruining presentation is to gently push a dinner knife through the filled from the side. If the fish breaks through easily it is ready. If it is tough it will need a few minutes longer). Squeeze over the juice from ½ a lime and sprinkle with sesame seeds. Divide among plates and serve with the remaining 2 wedges of lime. Sprinkle over some more sesame seeds if you like. Charred broccoli, delicata squash with tahini, dukkah and mint.